Disagreements among the Pathfinders erupted into violence 300 years ago, spurring the Society's leaders to don helms that hid their identities and protected them from assassins. These ten members of the Decemvirate have remained anonymous to this day, but a recent discovery may uncover new information about this dangerous part of the Society's history. 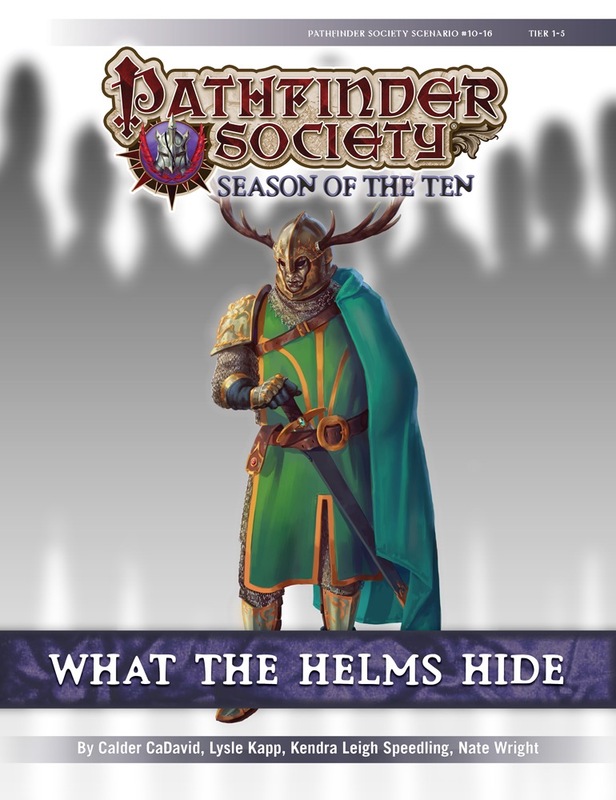 With a unique window into the past, it falls to the PCs to identify these original leaders and the secrets they buried before donning the helms—in the process helping to unveil a hidden threat to the Society. 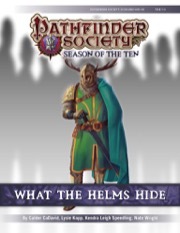 What the Helms Hide includes four 1-hour adventures that send the PCs across the Inner Sea region to uncover the secretive Decemvirate's past. The series includes a finale adventure, but players can experience the other parts in any order. What the Helms Hide is a Tier 1-5 repayable scenario that consists of four short one-hour long quests. “Collection,” “Autumn,” “Dust,” and “Witness.” “Collection” should always be played first, “Autumn” and “Dust” may be played in any order, and “Witness” is the thrilling finale. Each quest is penned by a different author and comes with its own player handout. Each has a chance for battle, a social encounter, and to uncover clues regarding their respective mini mysteries. Also, this scenario has a lot of great artwork in it! The first quest, “Collection,” is written by Lysle Kapp and takes place in Korvosa’s Jeggare Museum. Here PCs will need to inspect relics discovered by the famous Pathfinder Helven Leroung and uncover clues about her history and character. You also get to delve into Helven’s relationship with the famous Montlarion Jeggare, for whom the museum (and much more!) is named. His descendant, Mercival Jeggare is curator of the museum and willing to lend you a hand. There’s a lot of information you can learn here, although groups are unlikely to get all of it, which I rather enjoyed. “Autumn” is written by Calder Cadavid and takes places in Andoran’s Arthfell Forest. PCs investigate a sliver of the history of the Pathfinder Zaul Blystone. It has amazing art for an NPC, Adelyn Rhinon, which is my favourite art in the scenario. This is a fun quest although I do have one minor complaint. I feel like one of the characters gives up a bit too easily. enacting a sort of ritual to activate a secret cache hidden by the gnome Pathfinder Eylysia. As Master of Scrolls Kreighton Shaine and two members of the Decemvirate watch on, your players get to experience an important event from Eylysia’s past. It's awesome. I loved the final battle and the revelations it uncovered. And Eylysia’s final line was SO good. What the Helms Hide is a really great series of Quests. So great, in fact, that it’s my favourite series of PFS Quests to date. All of it’s component Quests were enjoyable, but its the finale that really ties it all together and makes it exceptional. Really well done from the whole team of writers. Best. Quest. Series. Idea. Ever. Unless they take place in locations better suited to investigation by fresh, inconspicuous agents instead of Seekers whose faces are recognized around the Inner Sea. Wow! Only 4 quests instead of 6? Is this replayable? This will be replayable, yes. I wonder if the Helms hide . . . WORLD-THREATENINGLY BAD ACNE. I'm very excited to see the quest format reduced to 4, to better fit the one hour per quest, four hours per scenario formula. I am excited as well. I am also hoping it is a good set of quests to introduce to beginners. Looks like i might be running this in april! Any word on what bestiary will be needed for pawns??? I'd really like to step up my presentation. What are each of the quest names? It's out on wednesday 03/27 next week so you will have a better idea. It looks like the chronicle sheet has an error. Dang. I never even noticed that. Everything's shifted over one column too. XP is under gold pieces and PP is under XP. That whole chart will have to get shifted down too because you'll need two lines for the boons. This came up in the GM discussion thread, and a fix has already been made. Once it’s updated on the website, we’ll let you know. There are two wands awarded at the end of the final quest. Any possibility the chronicle sheet can be edited to add these two items? Otherwise, it's pretty pointless to mention them. With any luck it will be fixed before I need to print the sheets this weekend. Is this available for replay with level 1 characters only? How did it go for you? Table of six finished it in exactly 4 hours. Collection took 2..and i had to hustle the rest. I should have curbed some of that first encounter.